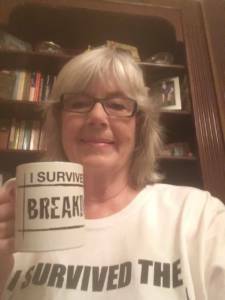 I survived the BREAKDOWN and have the tee shirt to prove it. Not only survived it but enjoyed it! You can own the tee and lots of cute swag by going to the BREAKDOWN Swag Store listed on my Books/Special Projects Page. BREAKDOWN is an exciting, ground-breaking 4-book suspense series I’ve written with three fellow USA Today bestselling authors. The series launches today with four short story prequels that show why the heroine in each of our novels fled to Shutter Lake, the perfect town…until the girl who knew too much was murdered. Get all four short read prequels today: no looking back, Debra Webb; her deepest fear, Vicki Hinze; just one look, Peggy Webb and trust no one, Regan Black. See more details on the Books/Special Projects page. The entire BREAKDOWN 4-book series will be available next month, one each Tuesday starting October 4: the dead girl, Debra Webb; so many secrets, Vicki Hinze; all the lies, Peggy Webb and what she knew, Regan Black. You can preorder all four now…and I suggest you do. In all the years I’ve been writing, I’ve never had such a unique, exhilarating and fun writing experience! Deb, Vicki and Regan are terrific writers and amazing women. Thanks to a career that spans thirty-four years, I get to count them as dear friends…and now collaborators extraordinaire. We couldn’t be more excited with the finished series if we had been awarded the Nobel Prize for Literature! Or won the lottery. Or the mirror ball on Dancing with the Stars. Now I have to quit writing this post because I have to work on a brand new Elaine Hussey novel…and because I’m getting punchy. But wait, there’s one more thing! As a special treat during the month of September, I’m giving free copies of the short story, just one look, to everybody who signs up for my mailing list. Some of you have already received your copies. I ask you not to share them but instead tell your friends how they can get a free copy, too! Thanks! There are lots of other perks to being a part of my mailing list. Next week I’m doing a drawing for the fans who have already subscribed. I’ll send three lucky winners a FREE ebook of their choosing from my backlist or my new novels that are already available. There will be other treats, too. After all, Halloween is just around the corner. I wish you many happy reading journeys and many blessings. USA Today bestselling author Peggy Webb writes romance, women’s fiction, literary fiction and cozies. Her popular Southern Cousins Mystery series earned her the title “comic genius” from her peers.